Chop coarsely 1 large onion, several peppers (your choice of sweet or spicy), two sticks of celery, 2-4 cloves of garlic. Fill the pot 1/3 full of chicken or vegetable broth or plain water works too. Add a generous teaspoon of dried rosemary or 1 tablespoon of fresh rosemary (you can add other herbs or different herbs if you prefer). That’s it…put on the lid and set the temp to high for 30 minutes. After 30 minutes adjust the temperature to low and allow it to cook away for the entire day. Halfway through the day, I use a potato masher to mash-up all the ingredients in the crock pot to make them more like spaghetti sauce texture. If you have a food processor, you can use that for this task. Then put the mixture back into the crock pot and allow it to keep on cooking. I usually let mine cook all day and through the night, but all day will be enough if you’re in a hurry. Then turn off the crock pot and allow it to sit on the counter and cool. Then it is time to either eat the spaghetti sauce straight away, freeze it in freezer containers or can it if you prefer that method of storage. Enjoy. Oh, and if you don’t already know, there is a recipe for Crock Pot Apples on the Recipes page of this blog. This is one of my favorite ways to cook because it is so easy, delicious and practical for busy lifestyles. Get to it and start cooking up all that delicious garden fresh produce you have. Soon the garden will be finished for the season or nearly so, so enjoy every bit of it while you can. This is how it all looks at the start of the process. Jerusalem Artichokes are pretty darn tasty. They have firm white flesh and a thin skin that looks a bit like ginger, although these plants are completely unrelated. Jerusalem Artichokes are part of the sunflower family. Some of the perennial sunflower members of this family have fleshy tubers for roots. To eat them, you can peel the tubers, slice them and eat them raw as a finger food like carrot sticks or dice them into a salad. You can also add them to stir-fry similar to how you might add water chestnuts. You can cook them in any way you would cook a potato. Some people think they taste like potatoes, but I would say they taste like their own selves…still really good. One of my favorite ways to prepare them is to peel them, cook them in boiling water until tender. Once they are done, mash them with some garlic butter, add a generous amount of sour cream and some shredded parmesan cheese and stir in well. Serve as you would mashed potatoes. Perfect! For the past two garden seasons we have offered plants of an annual sweet fruit called Sunberries and Garden Huckleberries. This year I planted both in my garden and in containers too. I wanted to see how they would perform for me in our climate and also I wanted to speak first-hand for how they taste. They’ve grown wonderfully for me in both the garden and in containers. Both plants are producing berries like crazy! Yesterday I picked a bowl of sunberries (the garden huckleberries aren’t quite ripe yet) and we all tried them freshly picked straight off the plant. Lizz said they tasted just green, I thought they were mildly sweet, Beki said they were melon-like and Chris agreed with her. Once washed, I put them in a baking dish, sprinkled them with brown sugar. 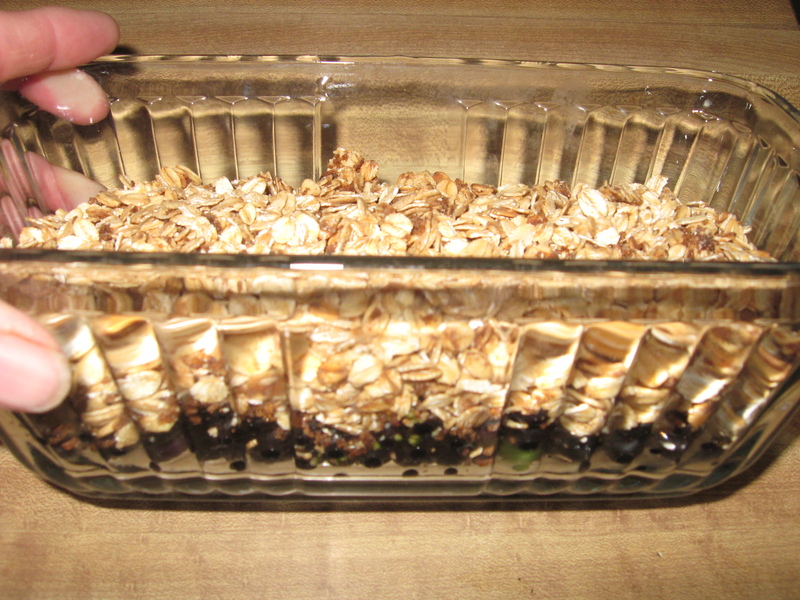 The topping is a simple mix of oats, butter, cinnamon, a tiny bit of cloves, and a little more brown sugar. Then I put the dish in the oven at 350 degrees for about 45 minutes. This morning we ate the sunberry crisp with yogurt and walnuts and a few dark chocolate chips on top. It was very tasty! 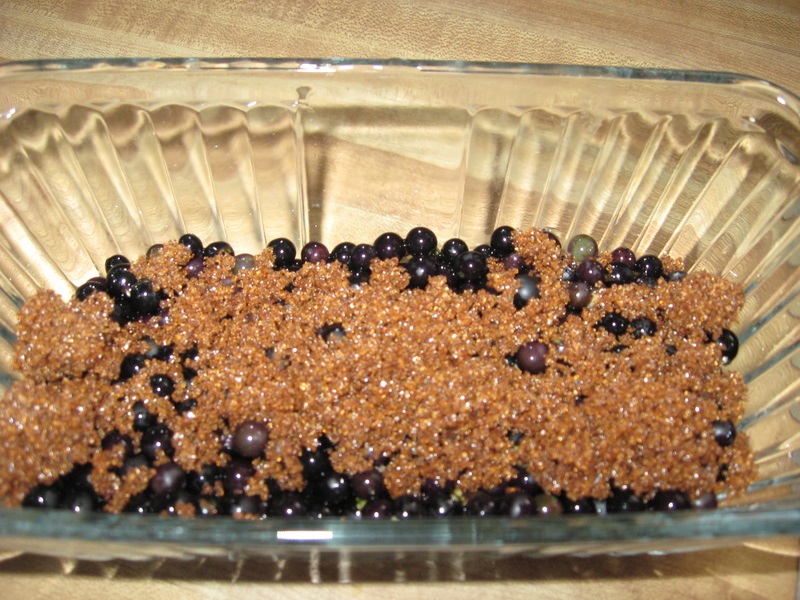 Both Sunberries and Garden Huckleberries are marketed in the seed catalog as a substitute for blueberries for people who garden in areas like Colorado where blueberries are nearly impossible to grow well. The catalogs say they are nearly tasteless until sweetened and then can be used any way that a blueberry can be used. I actually think they should not be compared to blueberries at all, because aside from their color and size they are really nothing like a blueberry. They should be promoted, I feel, as a sweet fruit in it’s own right. They are quite delicious, but they don’t taste like blueberries to any of us here at Desert Canyon Farm. It probably is true, though, that you could use them instead of blueberries in most recipes, but I think you should expect them to taste like sunberries or garden huckleberries, rather than a blueberry. Both sunberries and garden huckleberries are annuals, meaning that you will plant new plants each spring. They do well in full sun or part shade and are growing for me with a 4 day watering rotation, which is quite reasonable. They have preformed well in containers and in the garden soil and pests are not bothering them so far, even the grasshoppers which are eating my raspberries, are not eating either of these fruits. I think they are both winners if you want a berry crop to eat fresh, cooked or to freeze. I haven’t made any preserves or jelly from them, so I can’t speak for that. All winter long I’ve been storing and cooking winter squash and pumpkins of various kinds that grew in our garden last summer. Many years back I would store these vegetables and never cook them because seeding and peeling them was so difficult to do before I cooked them. Thankfully, my sister clued me in one time about a super easy way to cook squash that takes all that difficulty out of the process. These are red kuri squash. I set them in my roasting pan and take a sharp knife and slice several 1 inch long slices through the peel into the flesh. These slices act as steam venting holes when the squash or pumpkins are cooking in the oven. I pre-heat my oven to about 300 degrees. When the oven is hot, I pour in about 2 inches of water into the roasting pan and then set the whole thing with the squashes, just as you see them here, in the oven and let them slowly cook. 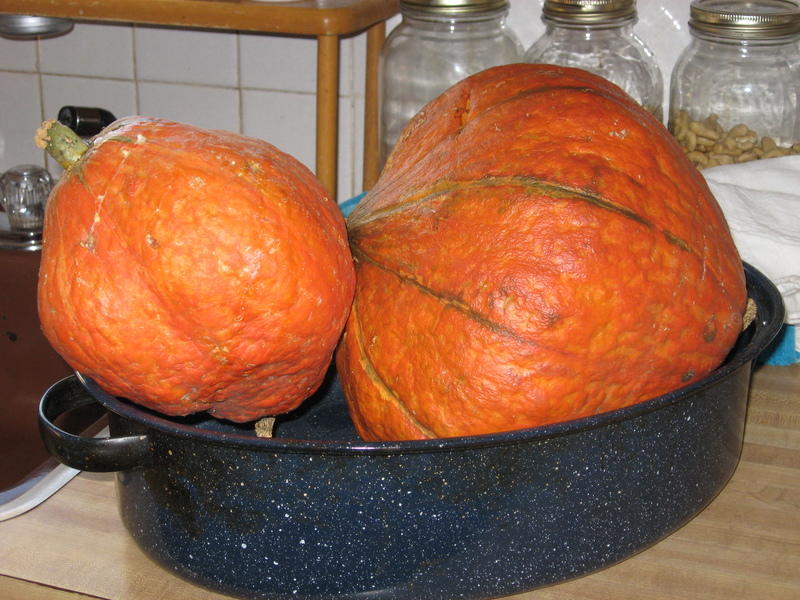 When the squash or pumpkin starts to cave in on itself, then it is done. Remove the pan from the oven and allow it to cool down somewhat. Then it is an easy process to slice open the squash, scoop out all the seeds and cavern stinginess. Once that is accomplished, I use a large severing spoon to scoop out all the cooked flesh from the rind. The rind and strings are discarded to the compost pile. The seeds can be composted too or you can roast them in a cast iron skillet with a bit of butter and sea salt for a snack. They are delicious! The cooked flesh is ready to become whatever you would like it to become. It can be mashed with butter and a tiny bit of brown sugar and cinnamon and eaten like sweet potatoes, puree and made into a tasty winter soup, cooked into pumpkin bread or biscuits…there are lots of ways to use it. If you have too much to use at one time…no problem, just put it into a freezer container and save it in the freezer for another time. In truth, this has to be the simplest and easiest way I know of to cook your winter squashes and pumpkins, no matter what variety they are. Enjoy! Cutting Celery is a perfect choice for cooks who want to have fresh celery on hand at all times, as it will easily grow in a pot on the countertop or it can be grown in the garden…your choice. This is a true species of celery, but unlike traditional celery which has stalks, cutting celery grows more similarly to parsley in that it doesn’t have any stalks and the leafy stems can be cut weekly. 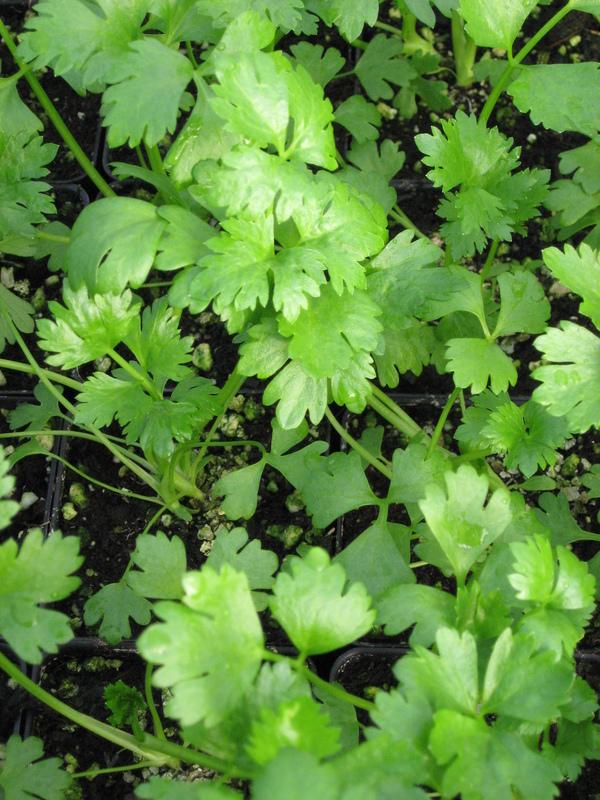 The plant will grow fresh leaves and this will keep the cook in good supply as a cut and come again vegetable or herb. 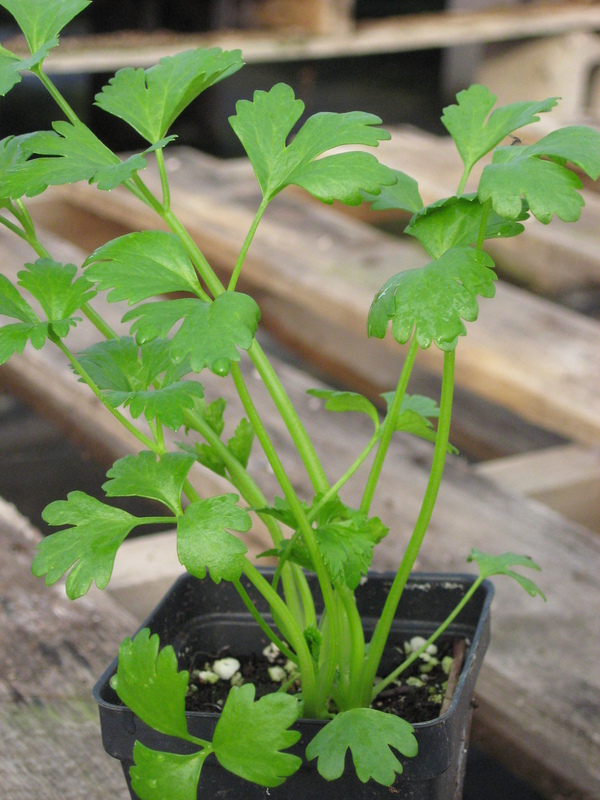 Cutting Celery will grow best in bright, but indirect light, with moderate watering. If it is grown in a pot, it should be fertilized once a month with an organic fertilizer (follow the label instructions for proper application rates). Use the leafy stems of cutting celery in absolutely any way that you would use stalk celery, so in stir-fry, roasted with meats and other veggies, chopped into potato salad or added to holiday dressing. At Desert Canyon Farm we fry onions, potatoes and garlic in a skillet, then toss in a generous handful of chopped cutting celery, drizzle everything lightly with olive oil or melted butter and enjoy as a lunch meal. The only thing you cannot do with this type of celery is make celery sticks to put on a relish tray or top with peanut butter, otherwise it is a perfect choice for all celery needs. Enjoy! Shallots are sweeter and richer tasting than either traditional onions or garlic. They grow in clusters like garlic and multiplier onions, and have papery skins and creamy flesh with just a tinge of pink markings. 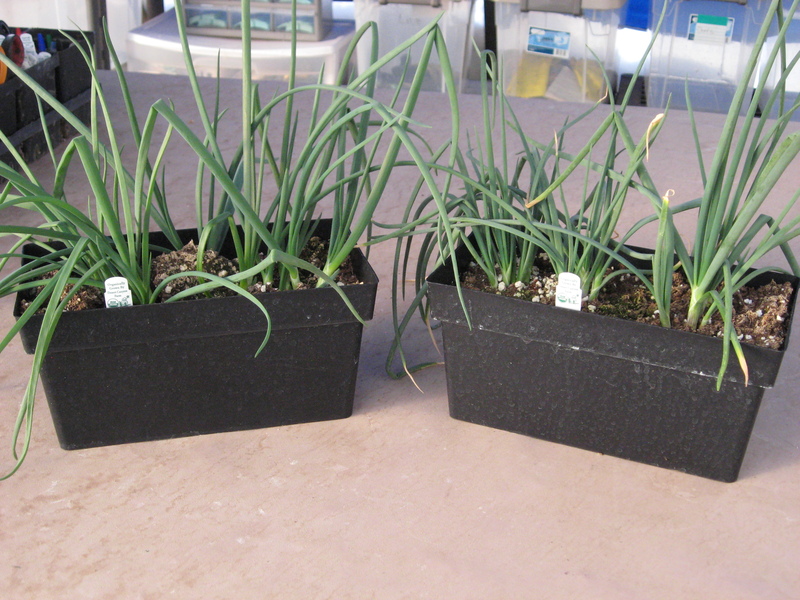 They are closely related to multiplier onions, which means that you can divide the clusters of shallots when you harvest, and plant one section back in the pot or the garden to provide you with a new supply of shallots to harvest in a few months. If planted in the garden, they will usually mature in mid to late summer. Use the rest of the shallots that you harvested in your cooking. While you are waiting to harvest the bottoms of your shallots, you can be snipping from the green tops on a weekly basis and cooking with these green tops like you would green onions or garlic tops. When the pot gets totally full of growing shallots, just dump it out, harvest the shallots, plant a couple of shallots back in the pot in fresh soil and continue the shallot growing event. A pot of shallots growing on the kitchen counter is the perfect gift for the winter solstice holidays, because cooks can use them on-going throughout the year. Cooking with shallots is easy and delicious! Peel the skins off and thinly slice the shallots. They can be added to soups, quiche, grilled on kebabs, sauteed with vegetables and potatoes, chopped very fine and added to salads. The green tops are delicious in omelets or as a garnish to soup, or as topping on pizza and tacos, etc. Enjoy! To your favorite chocolate cookie recipe add fresh peppermint leaves. Take a 4-6″ tender leafy stem of your favorite mint variety and chop it finely into your chocolate chip cookie batter. You can substitute frozen herb in an equal amount. Dried herb is not very good for this purpose. Bake as usual. To your favorite oatmeal cookie recipe add fresh lemon balm or lemon verbena. Anise hyssop is also quite good. Finely chop 1-2 tablespoons of fresh herb into the cookie batter and bake as usual. You can substitute frozen herb in an equal amount. Dried herb is not very good for this purpose. Bake as usual. Preheat oven to 425 degrees. Combine dry ingredients, herbs and chilies in a large bowl. Add milk and eggs and mix until blended. Set aside for a moment. Once oven is heated, heat the shortening in a 10″ cast iron skillet or an 8-9″ baking pan in the oven for about 3 minutes. As you remove the pan from the oven, tilt the skillet to coat the bottom with the shortening evenly. Pour heated shortening (or oil/bacon drippings if you used those instead). into the bowl where the other ingredients are mixed up. Mix in shortening well. Pour into the hot skillet and bake for 20-25 minutes or until golden brown. Serve hot or cold with butter or drizzled with honey. We also love cornbread topped with cooked beans and root vegetables or cowboy chili and colby cheese. This makes for a fast and inexpensive meal, plus it is very hearty and delicious, especially on cold snowy days! This morning it was time to deal with all the garden veggies I have piling up on my kitchen counter. Loads of heirloom tomatoes of all kinds, hungarian round sweet peppers, carrots, onions, and garlic, plus rosemary, cutting celery and thyme for seasoning. My solution to the situation that is fast and easy is a slow cooker full of all of the above cooked in chicken broth. At the end of 8 hours I will turn off the cooker and allow the whole batch to cool off some and then it will be put into freezer containers and tucked into my freezers for use this winter. You could also can the whole batch, but I have limited space to store canning jars, so freezing works well for me, and it is easy and fast. If you want to mimic the process, coarsely chop up about 4 cups of tomatoes, 3-4 sweet peppers, 2 large onions, 4-6 carrots, and about 4-6 small to medium garlic cloves. Add to this a tablespoon of chopped fresh rosemary, a teaspoon of fresh chopped thyme, 1-2 tablespoons of cutting celery leaves chopped. 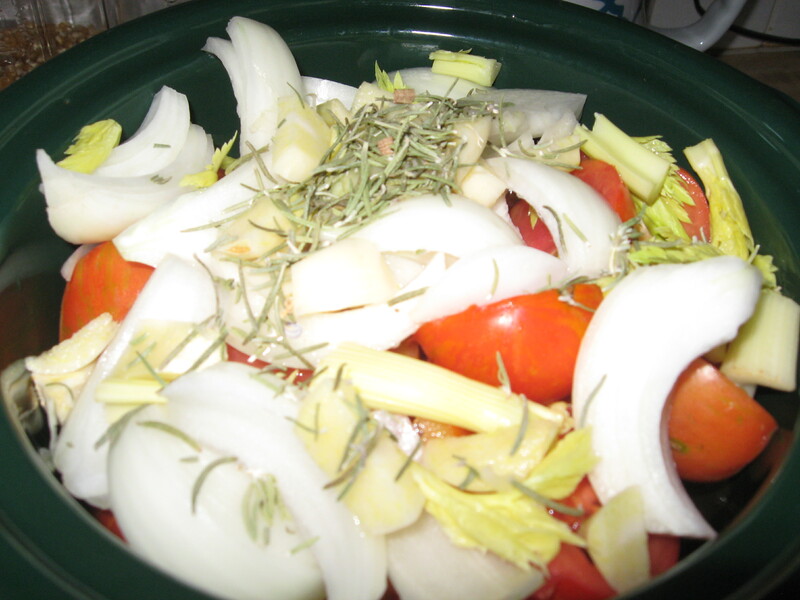 Fill the slow cooker to within 2-3″ from the lid with chicken broth (either homemade or organic purchased broth). A small pinch of sea salt finishes the whole batch off and your good to go. Turn your slow cooker on high for about 1 hour and then reduce the setting to low and continue cooking for 6-7 more hours. At the end of the cooking time, turn off the heat and allow the batch to cool some and then fill your containers. Label and freeze. 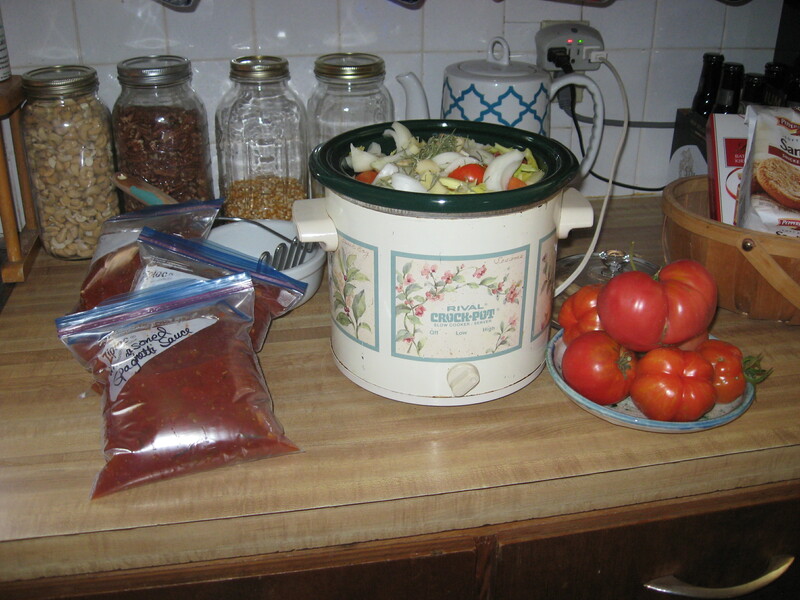 I will use these stewed tomatoes and veggies to make soups, cowboy chili, beans and rice…all sorts of hearty dishes on cold wintery days. The stewed veggies are also cook just as they are on top of rice or cous cous and served with a loaf of delicious warm bread. And speaking of gifts, I think salad lettuces freshly picked from my garden or bought at the farmers market are one of the best gifts I receive. 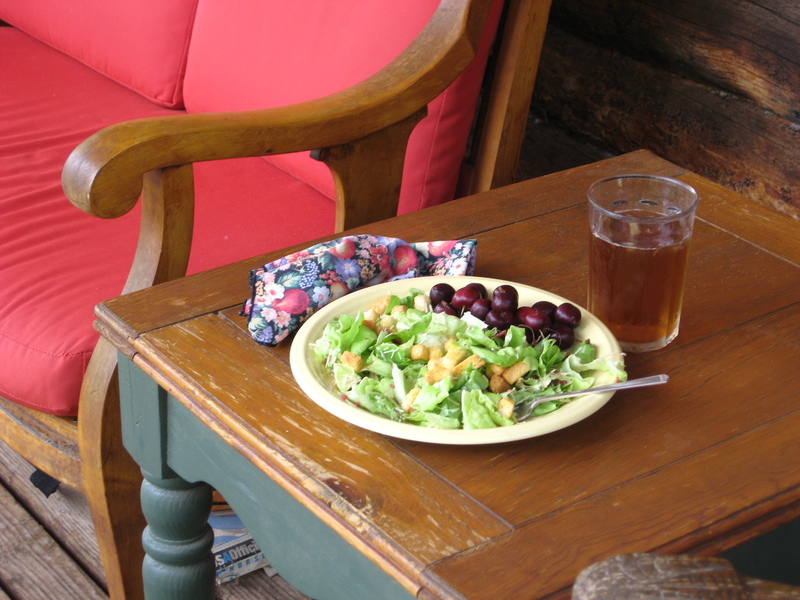 My lunch today was made up of butterhead lettuce and sweet cherries. Simple and delicious. Tear, don’t cut or chop, your lettuces into a size that is easy to eat and then EMBELLISH your salad as you see fit. My salad today was the simplest of simple…just lettuces, parmesan cheese, a bit of fresh lime juice, a sprinkling of bacon pieces and some croutons. Other salad embellishments might include, but of course is not limited to, walnuts, a chopped apple or pear, dried cranberries or raspberries, finely sliced yellow or zucchini squash, cucumber or eggplant. Well, you get the idea. Basically, the possibilities are endless, so just have fun. Once your salad is made, remember to whisper into the universe a simple thank you and then enjoy!! Here is todays tip: Make a rosemary baked potato lunch. Gourmet baked potatoes are easy to make and absolutely delicious, plus the topping choices are virtually endless. Experiement for what you like and, most importantly, have fun!! Add all of the ingredients above to top your baked potato. Adjust the ingredients to your personal tastes or diet. Add other ingredients of your own choice if you so desire. This is a favorite soup for the cold months of the year, and while we still have pumpkins and winter squash from last year’s garden harvest. You can prepare it from either pumpkins or winter squash like red kuri or any butternut or kabocha type. Serve it with a loaf of crusty warm bread, butter and maybe a bit of whipped honey. Melt butter in a skillet and saute the marshmallow and ginger roots until tender, about 5 minutes or so. Transfer to a large cooking pot and add the broth, simmering gently for another 5 minutes or so until the marshmallow and ginger are softened. Combine approximately 1 cup pumpkin or squash with 1 cup broth mixture and 2 tablespoons milk in a blender and puree until smooth. Pour into the cooking pot and repeat this step until all the pumpkin is pureed and poured into the cooking pot. Now heat the soup until it is just warmed through, but do not boil. Your ready to eat! Fill a crock pot/slow cooker with sliced raw apples. I prefer tart apples, but any variety will do, and you can either peel them or not, your choice. Add 1/2 stick of butter (the real stuff, not margarine! ), 1/2 to 1 cup of dark brown sugar, adjusted to your taste preference…add more for sweeter apples, less for a more tart flavor. Put the lid on the slow cooker, turn on to high temp for 30 minutes and then reduce the temp to low. Cook apples until they are just tender (about 3 hours or so). Then serve up a big bowl for yourself and enjoy! These are also good eaten topped with vanilla ice cream, made into fruit crisp or cooked into apple pie. They are wonderful added to a bowl of hot cereal or topped with whole milk yogurt for breakfast. Your gonna love these apples! I just finished emptying the dehydrator of tomatoes and re-filling it with roasted sweet peppers. During the Middle Ages in Europe, tomatoes were called “love apples”. Isn’t that a great name for them!! Anyway, I dehydrated a bunch of red robin cherry tomatoes that had been cut in half and sprinkled lightly with garlic seasoning before they were dried. Now that they are completely dehydrated the garlic seasoning has infused them and they are absolutely delicious. If you have a lot of tomatoes coming in from your garden harvest, dehydrate them as an easily, and space-saving, method of storage. When your ready to use them in winter, you can simply toss some into your spaghetti sauce, sprinkle them into pasta salad, or add them to cowboy chili. At our house we rarely have them long into the winter months, because they are just so tasty to eat plain that we snack on them while we’re watching a movie or take a bag of them with us on hikes. 4 medium to large sized heirloom tomatoes: we like Siberian Tomatoes, Taxi Yellow Tomatoes, and Stupice Tomatoes for salsa, but really any juicy delicious homegrown tomatoes will do nicely. For mild salsa, use 3 jimmy nardello sweet italian fry peppers or romanian fry peppers. For medium hot salsa, use 3 ancho pablano peppers or serrano del sol peppers. For hot salsa, use 1-2 jalapeno or habanero peppers. Coarsely chop tomatoes and peppers. Peel off husks and discard on tomatillos and chop tomatillos, then add to the peppers and tomatoes. Add all chopped herbs, onions and garlic and mix gently, but well. Finally, drizzle salsa with the lime juice and refrigerate for 30 minutes to mingle flavors before serving. Feel free to experiment and adjust any ingredients to your personal tastes. Serve with chips or top any mexican food dish, such as tostadas, tacos, burritos, etc. We also like this salsa added to pita or flour tortilla sandwich wraps or mixed into a basic green salad. Mix tomatoes, cheese, basil and other herbs in a large bowl. Sprinkle lightly with garlic salt to taste. Drizzle with olive oil to coat lightly. Refrigerate up to 4 days. Please remember that all ingredients are approximate and feel free to adjust to your personal taste. Place all ingredients in a food processor or blender and pulse a few times. Then puree to desired texture. Pine nuts, almonds or pistachios may all be substituted for walnuts. To roast walnuts, spread on a cookie sheet and bake at 350 degrees, stirring occasionally until fragrant and lightly browned (about 5-7 minutes or so). Optional: add 1 tablespoon of fresh chopped rosemary, thyme or oregano to the biscuit mix. You can choose one herb choice or do a mixture of the above choices to make delicious savory biscuits. 2) Preheat oven to 425 degrees. Mix all dry ingredients together in a large mixing bowl. Add softened butter and shortening (cut into 1/2″ pieces or so), and mix until crumbly like coarse cornmeal. fold in squash and blend. 3) Turn dough on a floured surface and knead until smooth, adding extra flour if necessary to make the dough smooth and workable. Pat dough to 1″ thick. Using a biscuit cutter or an open end of a drinking glass dipped in flour first, cut dough into round shapes and arrange on a greased and floured baking sheet. Brush the top of each biscuit with melted butter and bake. 4) Bake until golden brown, about 18-25 minutes. Let biscuits cool on a rack about 15 minutes and serve with butter and/or honey. Maple syrup is good drizzled over too. We like these biscuits with stew, green chile or ham. Note: Biscuits may be stored at room temp for 2 days in an airtight container. I make big batches and freeze the extras for other times. chicken broth, veggie broth or water (your choice) to cover all the above ingredients in the crock pot. Put the lid on the crock pot and turn on to high setting for 30 minutes. Then reduce temperature setting to low and allow to cook for 6-8 hours. To serve, warm flour tortillas and fill with the lambs quarter potato filling. Top with grated Colby cheese, chopped tomatoes, green onions and a bit of cilantro. Add hot sauce or salsa to taste. This is filling and delicious. Any extra can be frozen for another time. Enjoy! Now, in a skillet brown a pound of pork sausage and half pound of bacon with a large onion that has been chopped coarsely. 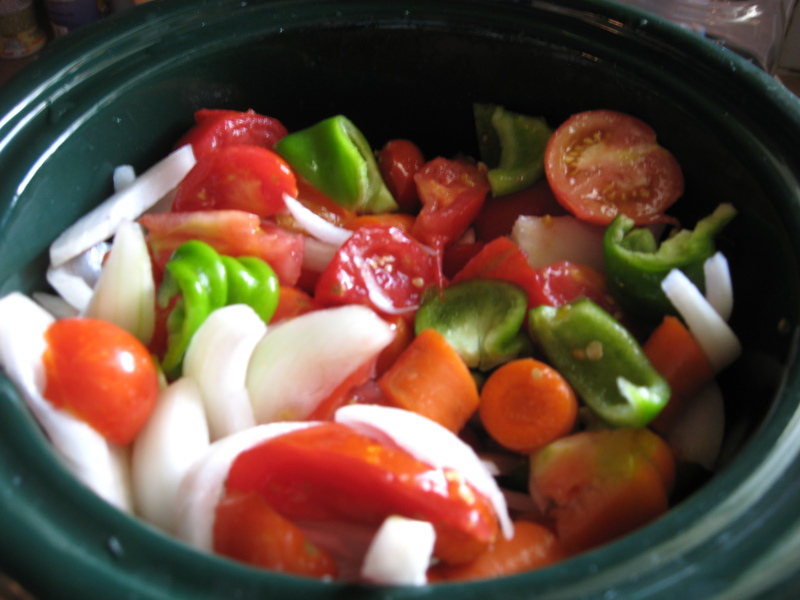 Once the meat and onions are browned nicely add them, along with the drippings in the pan, to the kettle of vegetables. Allow the stew to simmer gently for 1-2 hours. If you are cooking the stew in a crock pot, set the temp to high for the first 30 minutes and then reduce it to low and cook for 6 hours. We ate this stew with buttered corn on the cob. A loaf of hearty fresh bread would be equally delicious. I froze the left overs for another time. Enjoy!